If you have reached this page, but were searching for the First World War poem From Steyning to the Ring, see an article about the poem HERE. Chanctonbury Ring is a place of myth and mystery. It is a large hill-top enclosure or hill-fort, which has far ranging views from the north edge of the South Downs across the Weald to the North Downs. There are views of the sea to the south and lines of sight to other prehistoric landmarks. The banks of the Chanctonbury hill-fort were originally very much higher than they appear today and on the outer edge was a deep ditch. Chalk cut from the ditch was piled up to form the bank. The structure is roughly oval and measures about 550 by 400 feet. Towards the east and south-west are two entrances. Ancient tracks, round barrows and cross-dykes surround the site. The enclosure was dated after excavations in 1988-91 as late Bronze Age. The use of such sites in later times may be unrelated to their original function and at Chanctonbury this includes two Roman-style temples or shrines and four World War II gun emplacements. Neolithic finds at the site include a polished flint axe, an arrowhead, scrapers and other flint pieces. There was a small amount of early Bronze Age pottery, late Bronze Age copper-alloy gouges and a sword-hilt fragment. Before 1988, a suggested construction period for the enclosure was the pre-Roman Iron Age. Only a shallow pit containing Iron Age debris and some carbon dated bone might support this, despite the camp once being dated to that era. The latest thinking is based on an excavation after the hurricane of 1987, when many trees within the enclosure were torn down. An analysis of the pottery finds in relation to other sites suggested a construction date for the enclosure during the 7th century BC, or "the end of the late Bronze Age". There are round barrows scattered along the ridge at Chanctonbury. Three of these, aligned closest to the enclosure, have been excavated with no result. A mound to the west revealed the burial of a woman who died in her early thirties. She was buried with a bronze dagger. There was also a single post hole surrounded by flints and a cremation. The finds suggest an early Bronze Age date for the round barrows. Chanctonbury Hill has been frequented for thousands of years, but archaeology has yet to reveal a coherent story. The two Roman-style shrines or temples within the enclosure seem consistent with the idea that an older place of worship was originally sited there. The Romans often adopted prehistoric religious sites or structures for their own sacred rites. The cross-dykes also appear to have been built in Roman times. 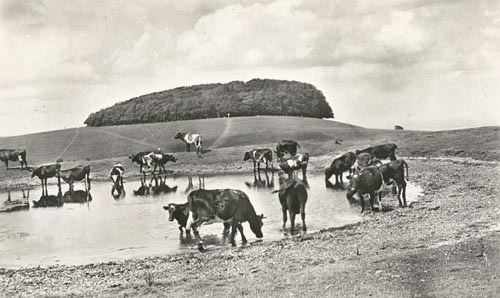 photograph is part of a large collection in the Steyning Museum library. 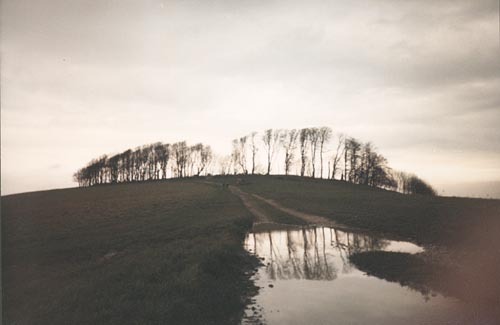 Chanctonbury Ring has been difficult to excavate because of the cluster of beech trees first introduced there in 1760 by Charles Goring, then owner of the land and of Wiston House nearby. The hurricane of 1987 destroyed many trees and allowed for some excavation before young trees were planted to restore the prominent hilltop landmark. This may not assist further archaeology but many local people believe the name Chanctonbury Ring refers to the trees and not to the ancient enclosure. The sight of Chanctonbury Ring without its thick clump of trees was viewed as a local tragedy and restoring the "ring" of beeches was a popular move. See a picture and read about a small Roman pot found at Chanctonbury Ring on our Exhibits pages HERE. Listen to Clare Balding's BBC Radio 4 episode of "Ramblings", when she walked with local friends from Bramber Castle to Chanctonbury Ring, before heading down to Washington.